View More In Tires & Wheels. Nothing spoils a road trip or commute faster than a flat tire. When roadside service can't get there soon enough, reach for the Powerbuilt 12V Electric Jack and Tire inflator. It's the perfect road trip companion for added peace of mind. Leave the wimpy greasy bottle jack in the trunk. Instead, grab the sleek powerful 2-in-1 jack and position it under your vehicle lift point. Plug it into a 12V outlet and press the button. Like magic, the lifting post extends and raises your vehicle up to 14" high. With 1 ton lift capacity, it has more than enough power to lift one side of almost any passenger vehicle. And if your spare tire is a low on air, just use the built-in 115 PSI inflator to air it up to proper pressure. 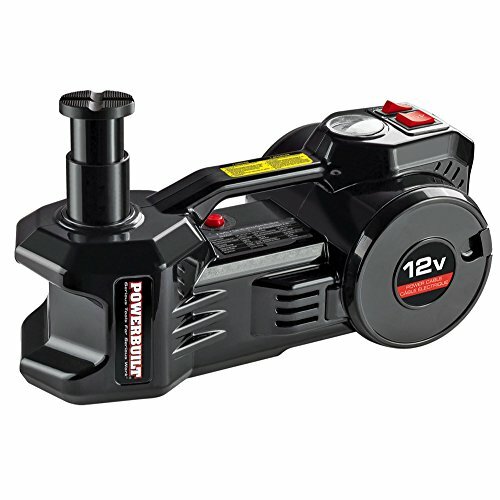 The Powerbuilt 12V Jack is clean, simple, safe and effective. Lift Range - 5.315"- 14.17"
If you have any questions about this product by Powerbuilt, contact us by completing and submitting the form below. If you are looking for a specif part number, please include it with your message.